Colehayes Park is the perfect venue for those looking for somewhere relaxed to extend their wedding celebrations over a long weekend or whole week (rather than a single day). 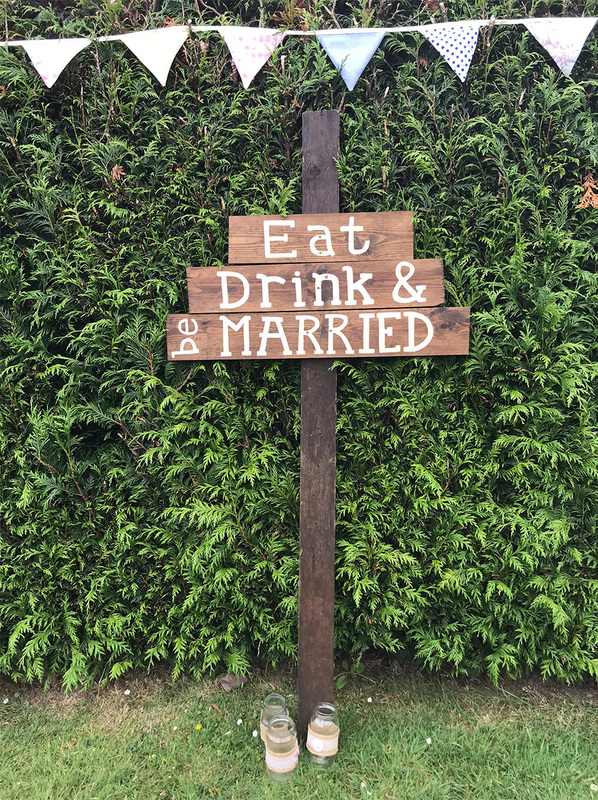 Not only is the house a fully-licensed wedding venue but we can also sleep up to 70 guests in the manor and a further 11 in Cork Tree Cottage. This offers a unique opportunity for guests to enjoy the company of friends and family for a longer period of time and in a more intimate setting. We are also unique as a DIY wedding venue which means that you have the choice and freedom to create your own perfectly individual wedding. Despite its size, the house has a informal and cosy atmosphere, making it feel like a giant home from home. Exclusive Use – Totally private Grade II Listed Manor house exclusively yours to host your ceremony, accommodate your guests and hold your wedding celebrations all under one roof. Location – Tucked away from the world on the edge of Dartmoor National Park, but only 3 hours by public transport from London and only a 5-minute drive from the A38. Capacity – Weddings for 30 to 250 guests. Cosy enough for intimate weddings but plenty of space for larger parties. DIY style venue – a blank canvas where you can let your imagination run wild. You can style your wedding to suit your personality: Classic & Traditional, Bohemian, Country Rustic or Festival Chic, the choice is yours. Budget – Hire our venue and choose your own suppliers to fit your budget. You are always in control of your costs. We have No Hidden Fees & No Corkage costs. Entertainment – Indoor space for bands and live outdoor music permitted. Basement space for an all-night after-party. Accommodation – Facilities for over 70 under one roof and more options on-site for additional guests, including our ‘Cork Tree Cottage’ rental in the grounds available for 11 extra guests and our dedicated camping field. Atmosphere – secluded, calm, friendly, homely, relaxed. Child & dog friendly. Wedding Day Facilities – 5 outdoor and indoor licensed ceremony areas. Dining room which can seat up to 90 guests, or garden space for a marquee if required. Exquisite reception rooms with magnificent garden views and your own private Bar. 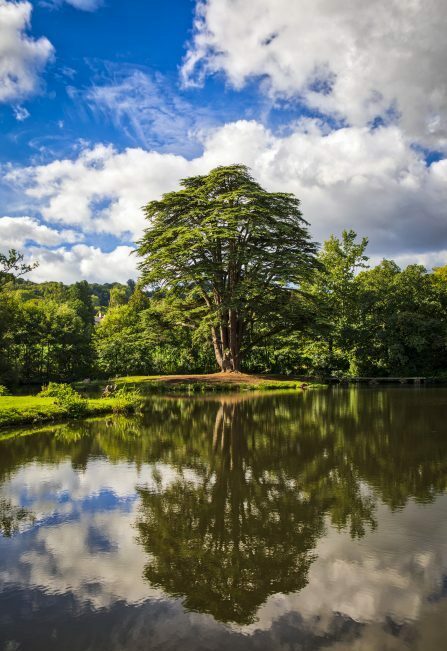 Setting – 20 acres of tranquil and picturesque surroundings of woodland, river, and gardens creating a beautiful backdrop for your wedding photos. Including a large private lake for swimming, boating and canoeing – perfect for nature lovers. Helping Hands – a wonderful team of Expert Staff available to assist should you want the extra help. You can hire the manor for a long weekend from 3pm Friday to 10am Monday, or you can choose to hire the manor for a week. This is especially popular in the summer as your guests can stay and spend more quality time together, enjoying the beautiful surrounding areas of South Devon. As an exclusive use venue, you won’t be disturbed by other people; the house is entirely yours. The manor can comfortably host weddings for up to 90 people, but with the addition of a marquee in our beautiful grounds, you can have up to 250 of your friends & family present to celebrate with you. We are licensed for indoor and outdoor civil ceremonies in 5 locations throughout the house and grounds. For indoor ceremonies, we are licensed in the oak panelled front hall and the beautifully styled living room. 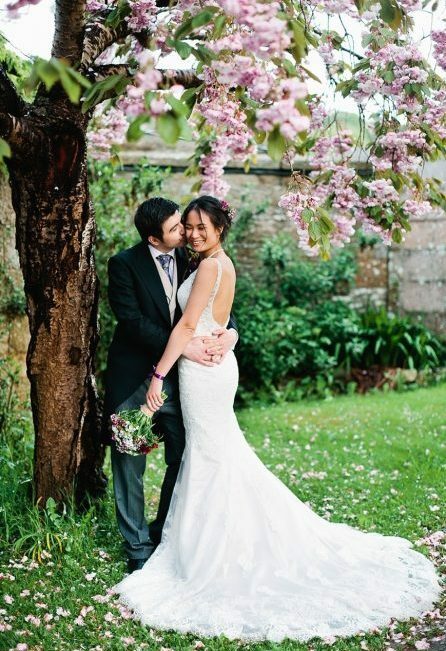 Outside, we are licensed for ceremonies at the front of the house, the granite steps leading into the gardens and our lovely hand crafted custom-made wooden wedding pagoda. As a DIY wedding venue, you are in complete control of what you want to do, how you want to do it and most importantly, how much you want to spend. You have full access to the house and are in charge of organising your own catering, flowers, décor, entertainment and photographers to suit your style and budget. Every wedding is as unique as you are and we don’t believe a one size fits all package allows the freedom that is required to make your wedding perfectly yours. We are more than happy to recommend trusted suppliers but we do not insist that you choose one over another. You can make your big day as formal (award winning banquet style caterers) or as casual (friends and family all bringing their favourite dish for a fantastic buffet) as you wish. We have an entertainment and alcohol licence allowing you to have a pay bar if you wish, supply yourselves or ask guests to bring their own (no corkage fees!). We also have a team of helpful and reliable staff available to help with washing up, cleaning, cooking and bar work, should you wish to have the extra helping hands. As one of the largest self-catering accommodations in the UK, sleeping over 80 people on site, Colehayes Park is an ideal venue for weddings. The house has 21 bedrooms, all of them light, clean, comfortable and with views over the estate. Comprising of a variety of dormitory, twin and double rooms, the manor sleeps up to 70 people. Our elegant bridal suite has an antique 1830’s four poster bed and en-suite bathroom, equipped with spa tub and separate shower. All other bedrooms have washbasins and share large bathrooms with multiple toilets and showers. Our separate rental, Cork Tree Cottage, can sleep a further 11 guests in 5 bedrooms. We are here seven days a week to give you as much or as little guidance as you want. We can be on hand to point you in the right direction and provide helpful advice as you plan your wedding. You can also get ideas from our gallery or our Facebook and Instagram. Once you book your wedding you are also welcome to visit us as many times as you require. We have a long list of recommended suppliers who we have got to know well over the years. We know from experience that they are eager to go the extra mile for our guests and we have had nothing but positive feedback from our newlyweds. Please take a look at our DIY directory for a list of options. Whilst we recommend these suppliers, should you prefer to source your own, you are very welcome to do so. We have no bias from one supplier to another, they are simply recommendations to give you some ideas to help get you started with your planning. To browse some of our recommended suppliers, please see our DIY Directory. From catering to photography services, the directory lists a range of locally-based companies that provide high quality service at great value. If you would like further recommendations or advice we are more than happy to lend our years of experience. We host over 35 weddings per year and have been a wedding venue since 2000 so we have lots of knowledge to draw from! How many people is Colehayes licensed for? Because we are a self-catering holiday house rather than a hotel, we do not have an official restriction on the number of guests. For safety concerns, however, we do like to keep the total numbers to around the 120 mark going up to 150 at the max. If you would like a larger wedding of up to 250 guests onsite please speak to us and we will discuss the options of making use of our camping field by hiring a large marquee, bell tents and hiring additional toilets, showers etc. What is included with your stay at Colehayes? You have free use of 24 trestle tables, an eclectic mix of 200 chairs, all equipment in the kitchen, cutlery, crockery and glassware for over 100 people. If you want to hire more equipment or have a specific theme please look on our supplier pages for ideas on where to find rental items. After you have checked that your dates are available on our Availability Calendar, please get in touch with us to come around for a viewing to see the beauty of Colehayes first hand. If you would like to get your dates locked in, we will send you our booking form and T&Cs. Then we take a £1,000 deposit which will be offset against your total balance. If your date is less than 12 months away we will take a deposit of 33% of your total balance, with the final amount due 6 weeks before your arrival. Where can wedding ceremonies take place? We are licensed and approved for ceremonies to take place at 5 different locations on the property: outside in our pagoda, on the front steps, on the back steps, in the wood panelled front hall and in the large living room. Do you charge extra for marquees to be set up? No, but you will need to source and hire a marquee. We can recommend local suppliers if you need some help. Can I move furniture and take paintings off the walls? We allow you to do whatever you like providing you leave the room exactly how you found it. Yes, we allow up to 5 well behaved dogs to join in your celebrations. We provide tea towels for the kitchen and hand towels in all bathrooms but we do not provide bath towels. Guests can either bring their own or they can be rented for £1. Will the house be cleaned daily during our stay? The house is a self-catering venue where you can have everything 100% DIY and not be disturbed by anyone else. The house will be spotless when you arrive but if you do wish to hire staff to freshen up the reception rooms, kitchen and bathrooms, we have a team of lovely ladies available who can be booked in for you. Colehayes is also run as a Field Studies Centre for school groups so we very much welcome children of all ages for any event at the house. We have 6 high chairs and 5 travel cots but we do not supply bedding for babies. Some rooms can sleep up to 7 people in bunk beds and single beds, which makes for a fun dorm room atmosphere for teenagers. We have a huge amount of space where children can play and we have games rooms in the basement with a pool table, table football and table tennis to keep kids occupied in the evenings and on rainy days. We also have a small outdoor adventure centre tucked away in the woods on the estate which can put on numerous fun activities for children of all ages. Many guests often also hire bouncy castles, soft play areas, magicians etc. If you would like a babysitter to give the parents some time to let their hair down there are numerous local childminding services in the area. We have one bedroom with a double bed located on the ground floor which has a wheelchair friendly wet room bathroom opposite. We have portable ramps to enter the house and the wheelchair friendly bedroom is easily accessible to the main reception rooms. Colehayes Park was the perfect wedding venue. Rebecca, Kathy and Ellice were very kind, did loads of the thinking for us and allowed us to do our own thing 100%. Having the guests stay on-site made it a very special weekend and it got rave reviews from the guests. We couldn’t recommend the venue or management highly enough. Hope to return soon! Had our most amazing, beautiful, lovely wedding at Colehayes on 3rd August. Ellice and Rebecca could not have been better to work with, and we also hired Kathy and her crew for a day to help and they were all stars. It truly was the best day and I would recommend everyone we used. All in all, it was an amazing day, we could not have asked for better. We chose Colehayes Park as our venue, and I can’t say enough good things about this place. They’re one of the only totally DIY wedding venues in the country – you can literally do whatever you want which is exactly what we wanted. We had zero restrictions from decorations to the time we finished. They are so incredibly helpful, friendly, lovely and great to deal with. The house itself is absolutely stunning. Most of our wedding guests stayed with us, which was really important as we didn’t want our wedding to only last one day or to have to chuck everyone out at 11:30 – that’s just when the party is getting started! The location is absolutely stunning; there’s even a lake! It could not have been more perfect. Colehayes Park is one of our favourite wedding venues and one we would return to in a heartbeat. The most amazing thing about this Georgian mansion set in the Dartmoor Countryside is that quite literally anything goes; you can completely have it exactly as you want it with as much or as little help from the staff as you desire. 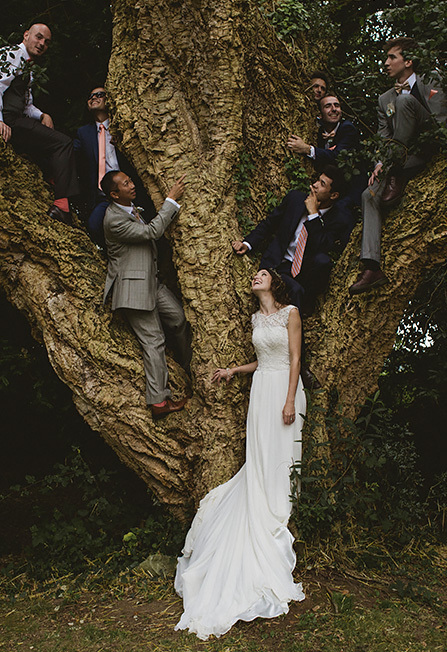 You can hire the entire place to yourself, you can have the ceremony outside next to a spectacular cork tree (one of only 9 in the UK! ), the building is beautiful and covered in Virginia Creeper, and the surrounding land is gorgeous: from the immaculate gardens to the lake with its historic stone bridge leading to a little island with a single huge tree, it’s beyond picturesque. Needless to say, we absolutely fell in love with this place and we are sure you will too. I think we knew as soon as we pulled up outside we wouldn’t need to look anywhere else. We took a tour of the house and fell in love. The biggest selling point was that we could do whatever we wanted; including our own catering and choosing our own décor. Once you arrive, the house is yours to do as you wish with, the owners do pop in and out if needed, but they also leave you to it. From the very first minute we arrived at Colehayes, everyone was so incredibly happy. Friday night was great fun and our wedding on Saturday was superb. We really couldn’t have been happier. The weather was perfect and the gardens were just so beautiful that all our photos are breathtaking. We hope the bagpipes weren’t too disturbing for the neighbours! We really hope that we’ll be able to hire Colehayes again someday for an anniversary or christening as it really is such an incredibly beautiful place. We feel so lucky to have found this little corner of heaven. Everyone at Colehayes was, without exception, brilliant. Rebecca is so wonderful and generous – we feel so blessed to have been allowed such a sense of ownership over such a special place. Wish we could go back and do it all over again. It was the perfect venue for us – stunning grounds, relaxed, plenty of space for everyone to stay and we really could do everything the way we wanted. With so much space and so many rooms in the house, there was enough space for everyone for the whole weekend. We couldn’t rate this venue higher, it was stunning. As you hire it for the whole weekend it makes the whole weekend one great family gathering as well as an amazing wedding day, luckily for us the weather was nice so we were able to have our ceremony outside. The staff were extremely helpful and accommodating to all our needs, they made the planning of the wedding go so smoothly and the day went without a hitch. Would recommend this venue to all. Colehayes is the sort of venue that attracts creative couples wanting to put their own stamp on their day, this coupled with everyone staying the whole weekend meant a wonderfully personal, relaxed feel to the day. Thank you so, so much for enabling us to have the most special and unique day we could ever have wished for. Colehayes is magical and the laid-back vibe and ability to have a wedding so bespoke really did surpass all our wildest expectations, all of our guests were blown away. And of course, having the pleasure of meeting such a lovely, kind, unique individual (Rebecca) really made it all extra special. We really could never thank you enough but would like to thank you from the bottom or our hearts; we will cherish our memories forever. We had exclusive access to Colehayes Park from the Friday to Monday and all of our family stayed onsite. Importantly, we could party as late as we wanted and choose our booze and caterers without restriction (or corkage!). The owners, Bill and Rebecca Brooks are lovely people and the staff are second to none. You can use the house as you please, decorate it and make it your own – and there are no curfews, so the party could – and did – continue into the night! Also, when we met with the fantastic owners, Rebecca and Bill, and their superb staff, they were just so friendly, relaxed and nothing was too much trouble however many questions I asked, and this was the icing on the cake for us! Rebecca, words cannot conjure up the magic of Colehayes. My son’s wedding last weekend was the most special day in all our lives. Thalia and Ed worked tirelessly to make the whole weekend unique and truly memorable. But thanks to you and your amazing staff everything gelled and their hopes became real. Basically, we all had a ball… Thank you so much! May the magic last not only in their marriage but at Colehayes so more people can imbibe the atmosphere!